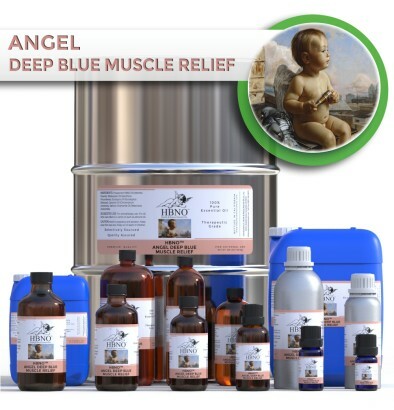 IL Health & Beauty Natural Oils Co., Inc.
HBNO™ Angel Deep Blue Muscle Relief blend essential oil is a quintessential addition to pain relief applications. Directions : Dilute at 3-10% strength (diluted in a carrier oil your choice : almond, grapeseed, avocado, etc..) and apply liberally on the affected areas (neck, arms, back, legs, etc..). Keep out of eye area. Ratios of dilution can be adjusted as personal preference. Apply as needed for pain relief. HBNO is pleased to offer HBNO™ Angel Deep Blue Muscle Relief in small packing to bulk and wholesale quantities. We can supply any amount of oil to anywhere in the world. We can also formulate according to your needs to meet your target price for bulk quantities. Peppermint essential oil is analgesic, antiphlogistic, antiseptic, antispasmodic, astringent, carminative, expectorant, febrifuge, nervine, stomachic, vasoconstrictor, decongestant, anti-inflammatory, anti-infectious, anti fungal, and digestive. Peppermint essential oil is effective for relieving headaches and migraines. It is commonly used on sore muscles and arthritic joints for reducing pain and inflammation. When a few drops are added to a toothbrush or mouthwash it cleanses the mouth and leaves the breath refreshingly crisp.The stimulating properties of peppermint oil improve circulation and blood flow, helping to deliver nutrients to vital parts of the body. It is also known to constrict capillaries, reduce headaches, fever, asthma, colds, sinusitis, chronic bronchitis, nausea, dizziness, neuralgia, muscular spasms, eliminate ringworm, relieve toothaches, freshen bad breath, and reduce hypotension. Wintergreen is a bushy evergreen plant grown in China. It has a characteristic sweet and minty scent with a light pink color. Wintergreen essential oil works well as a pain reliever, speeds healing for skin disorders, and is an effective antiseptic. It is widely used in preparations for the relief of muscular or joint related pain, derived from sports injuries and/or arthritis. Wintergreen essential oil tends to have a rubefacient effect meaning it can cause skin irritation on certain skin types. Eucalyptus has been a traditional remedy of the Australian and Tasmanian natives, most notably for wound healing, reducing fever, and combating infection. The aborigines used the burning leaves to ward off insects, acting as a primitive fumigation. In Western society the oil is used for vapor rubs and steam inhalation that benefits the respiratory system. A must have for your essential oil collection. Eucalyptus essential oil assists with asthma, colds, flu, chest, throat infection, catarrh, viral infections, herpes, cystitis, arthritis, bursitis, abscesses, boils, cuts, wounds, burns, blisters, ulcers, headache, migraine, neuralgia, muscle stiffness, bruises, sprains, stings, insect bites, fever, air purifier, immune stimulant, and swollen glands. When drops are added in a steam bath the oil helps to relieve congestion and clear the sinuses. Eucalyptus essential oil is analgesic, deodorant, stimulant, anti-neuralgic, antiseptic, increases circulation, anti-allergic, emmenagogue, febrifuge, stimulant, tonic, decongestant, antibacterial, antifungal, antiviral, and anti-infectious. Camphor essential oil is derived from the wood chips of a large evergreen tree grown grown primarily in Asia. Camphor was once commonly worn in a small pouch around the neck to ward off colds, flu, and other infections, and its scent was used an anaphrodisiac by the Arabs. Camphor essential oil stimulates the heart, circulatory system, and lungs, yet sedates the nervous system. The scent is an insect repellent. It also soothes muscle aches and tension, helps arthritis, subdues coughs, fights inflammation, and improves circulation. German chamomile has been an important medical plant since antiquity, as it was prized by Hippocrates, Dioscorides, and Galen alike. It has a beautiful soft scent which can only be described as gently and comforting. German chamomile essential oil is also known as “blue chamomile” due to green-blue chamazulene, a powerful anti-inflammatory property produced during distillation. German essential oil is known for its ability to strongly boost the immune system and it’s anti inflammatory effects. German chamomile essential oil is a versatile oil that treats the inflammation of sore muscles, sprains, tendons, and joints. It also helps with asthma, allergies, headaches, migraines, boils, acne, dermatitis, inflammation, arthritis, bursitis, neuralgia, burns, blisters, wounds, ulcers, broken capillaries, herpes, psoriasis, gastritis, gastritis, toothaches, menopause, and chronic infections. It is a strong immune stimulant, bolstering the defenses. It is a wonderful for anxiety relief and helps to calm the nerves. German chamomile essential oil is considered to act as an analgesic, anticonvulsant, antidepressant, anti-inflammatory, anti-neuralgic, antiphlogistic, antiseptic, antispasmodic, anti-allergic, carminative, emmenagogue, febrifuge, sedative, tonic, antiparasitic, antioxidant, and anticancer. Safety precautions : All products are for external use only. Consult a professional reference for correct dilution ratios prior to application. All written material copyright of IL Health & Beauty Natural Oils Co., Inc.